Introduction: David Smith began his career in the cable industry as a telecommunication technician with Western Union Cable company in 1953. 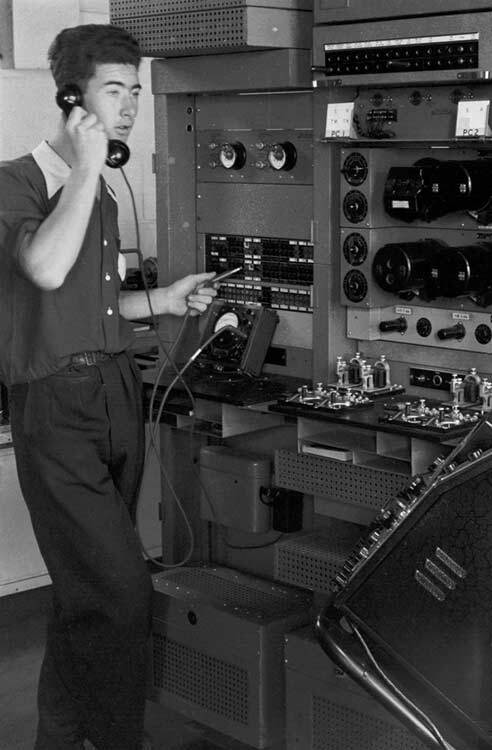 Following a brief service in the Royal Navy, he joined Marconi as a Research and Development engineer, and then moved on to Standard Telephone and Cables in Southampton as an R&D engineer. Leaving STC after it had become ITT, he set up his own consultancy. He holds two patents pertaining to cable manufacture. Here Dave Smith shares stories of the cable industry from his unpublished memoirs. When I left school, I was offered a job as a telecommunication technician with Western Union at their cable station in the city of London. The location was 22, Gt Winchester Street, a turning off London Wall. The outside of the building was unimposing and there was nothing to distinguish it from the many offices and financial headquarters that abounded that area, but step inside and it was a different world. The cacophony of noise that accompanies a teleprinter “hall” has to be experienced to be appreciated and this is accompanied by the strong smell of hot machines, oiled paper and the ozone of hundreds of electric motors. Normal conversation was difficult and the telephone had a padded headset that covered both ears. I suspect that current legislation would not permit this work environment but to me it was an exciting place. In this building we “talked” to the world. I say talked, but of course this was 1953 and transatlantic telephone cables were still a way off and we were using telegraphy. I expected to make the tea, but all food and drink was banned from the operations room and a canteen provided all our nourishment and was available 24/7. The cable station operated 24 hours a day but fortunately I was too young to be allowed to work the night shift so I was confined to 8-4, 10-6 and 2-10. Child exploitation had, I am glad to say, been abolished. Once I had become established I was designated a ”G” man, which involved being responsible for the American government communications from Washington and New York to American forces in Germany. These were secure systems and most of the time I was alone in a separate operations room with only the technicians in Germany and USA to talk to and these were almost entirely military personnel. Because all “talk” used a transatlantic cable that would otherwise be used for traffic, typing speed was essential so I was sent to a typing school to learn to touch-type. This was good for two reasons. One, I was a seventeen year old male and the other 32 in the class were 16-20 year-old girls and the other it has been a great asset in these days of computers. We used a three bank keyboard that had only capital letters, the upper case used for numbers and symbols. The older engineers communicated by morse key, even between locations on the same floor. The receivers were just a magnetic relay that went “click” as it operated, and “click” as it released, the spacing between these two clicks determined a dot from a dash. This was carried out amid the clatter of all the teleprinters and I never even managed to identify the sound of the receiver let alone what it was saying. In photo No.1 the sending keys and receivers can be seen in the foreground, but for me they were just decoration! All my machines used the five element telegraph punched paper tape. The paper tape reels used oiled paper to lubricate the punches. The ‘chads’ (the confetti from the punched holes) were a popular feature at weddings because, due to the slight oil, they stuck to everything they touched. You never left a rolled umbrella around as you could guarantee it would rain chads the next time you opened it! There had been eight transatlantic cables, at that time nearly one hundred years old, four out of Penzance (the PZ cables) and four out of Valentia in Ireland (the VA cables) but only seven were still operable, but I don’t remember which cable had failed. The cables were repeaterless but operated on a multiplex system which was purely mechanical. The multiplex unit consisted of a faceplate with four concentric continuous rings, surrounded by four more segmented rings. Each group of seven segments went to a different teleprinter or punch and provided a start pulse, five code pulses for each letter and a stop pulse. Connecting each continuous ring with a segmented ring was a pair of copper brushes rotating on an arm. There were therefore four pairs of brushes on each faceplate, each pair insulated from each other pair. The cable was connected to one solid ring and each teleprinter was connected to a group of seven segments. An identical faceplate was located in USA so that as each faceplate rotated, there was momentary connection from the transmitter segments in USA , through his brush gear to the solid ring, through the transatlantic cable to my solid ring, through my brush gear to my receiver. The faceplates were driven in synchronism by motors controlled by beautiful polished brass, temperature controlled tuning forks. The transmitting faceplate ran at constant speed but the receiver ran deliberately slightly faster. Synchronising pulses were sent on each revolution which were connected to one of the other sets of segments. These segments were physically offset from the signal segments and were used to index the brush unit on the faceplate when the synchronism had drifted half a segment. I can’t remember if there were four or eight circuits on each multiplex head. The other two rings were used for local circuits and monitoring. If any teleprinter was idle, that part of the system capacity was wasted and to overcome this, varioplex was introduced. 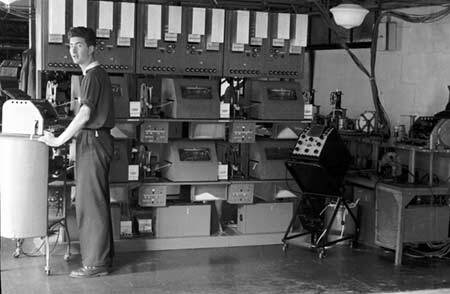 This was an electronic system using valves that kept the cable capacity fully operational and if one teleprinter was idle, the others speeded up to utilise the full system. It seemed like a better idea but the teleprinters themselves could not keep up with cable capacity if only a few were working and it was necessary to punch out tape at the variable speed into an accumulator and feed this into a constant speed tape reader. My time at Western Union coincided with the witch-hunt of senator McArthy’s anti-communism and as I was a G man I was subjected to intense investigation. As a 17 year old I did not understand the politics but it was explained to me that I had access to all the American forces spares ordering and from this someone could assess the strength and capability of the forces. They were tense days. Many years later, on a British cable ship, I was involved with a Portugese submarine, in Portugese waters when Britain was about to sink a Portugese vessel running the blockade of Beira during Ian Smith’s UDI in Rhodesia, but that’s another story. Last year I visited Valentia to see the old cable station, or what is left of it and stayed B&B in one of the cable houses. It was a strange sensation to stand on the beach where the cables, laid by Brunel’s Great Eastern 150 years earlier, came ashore and which I had actually worked 50 years ago. The telegraph cables were discontinued in 1966 and I wonder if there is anyone else out there who operated these systems!